Zoot Sims described him as “a nice bunch of guys” a reference to the many faces of one of the greatest jazz saxophonists of all times—not all those faces entirely endearing. Stan Getz was a complicated, self-destructive man, a heroin addict for many years, a raging alcoholic for many more, a man who made enemies at the same time he made some of the most beautiful, most melodic music ever played by a tenor saxophonist. 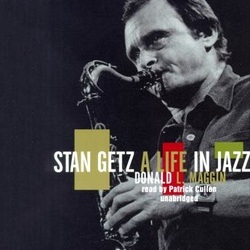 Donald L. Maggin’s biography of Stan Getz chronicles a life that contrasts the great artistic success of a man whose personal life was a shambles defined by addictions, depression, anger, wife-beating and philandering, right up until five years before it ended. There are just a few musicians whose sound is so distinctive the player can be identified within the first couple of bars of the song. Stan Getz was one of those musicians. His sound was a warm, sensuous one, a richer version of the mellow timbre of his primary influence, Lester Young. But Getz’s playing wasn’t defined only by that beautiful sound. He swung, too, and hard. And his improvisations were miraculous—thoughtfully constructed and wonderfully melodic. At the peak of his popularity, in the 1960s, Stan Getz traded places repeatedly with John Coltrane himself in the first place positions in the DownBeat and Metronome polls for “Best Tenor Saxophonist”—contests that contrasted Coltrane’s “sheets of sound” with Getz’s lyrical lines. In the late 1980s, at around 60 years old, Stan Getz learned that he had cancer, a reality that seemed to have had the effect of helping him finally straighten out his life. In an interview with The New York Times around that time, he said, "The thing I will always be proud of is this: Toward the end of my life, I became what I always should have been—a decent gentleman." In A Life in Jazz, Mr. Maggin has given us a most engaging and informative account of the life of a man who was both a monster and a gifted artist, out of whom poured beautiful, emotionally stirring music.